Exciting news! I started a business last month. 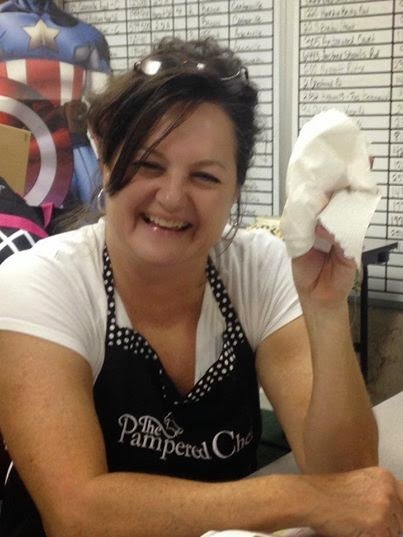 I agreed to sell products, do cooking shows and represent for The Pampered Chef. Like all excited consultants, I was ecstatic when a cousin of mine contacted me to have a show...unsolicited! Her real estate office is 40 miles from my house but, what the hay, I'm in business to sell and I'm there! My Mom went with me to help and take care of my 10 month old granddaughter. Due to the commute time, I had to leave before her mom picked her up. All is well. 12 guests rsvp'd. I'm a bit nervous but I've got this. When we arrived, only 3 guests were there (because they worked in the real estate office). They listened to my presentation from their office chairs, sometimes listening, sometimes working at their computers. I couldn't figure out whether to cook or not because two ladies said they weren't staying to eat. I had one lady though, intent on everything that I was doing so I decided to cook Pesto Vegetable Medley just for her. 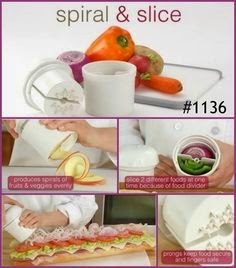 I'm showing off our spiral and slice which makes beautiful spiraled veggies. See.. This one lady was so interested in what I'm doing and I'm trying to answer her questions while I'm spiraling. I'm not sure why I laid my spiral and slice down but I picked up one of our forged cutlery knives to cut red pepper. Bad idea. Bad, bad idea! The next thing I know I'm bleeding from chopping a sliver of my finger and fingernail off! It bleed and bleed and bleed. My host, Jenny took me around the corner to an internal doctor to see if they could stop the bleeding. I was so thankful and still amazed that Dr. Kim put hydro chloride on my finger to stop the bleeding, cleaned the wound, put a band-aid on it and didn't charge me a penny! He also gave me some great advice. He said "Now, when you get home don't put no natural remedy like cow dung on that cut." I said "Well, if I see my dad anytime soon, he'll want me to douse it in diesel fuel." My dad swears by diesel fuel to heal any cut! We left the doctor's office and went back to cooking! Turns out my accident wasn't nearly as bad as I thought it was or as it hurt. Here's a pic of my finger one week later. You really can't even tell its cut. I think everything will grow back just like it was. My director, Melodie told me to be sure to keep my fingers tucked.....after the fact! I said I wasn't using the knife again unless I get invited to a luau and need to gut a pig! I didn't use any cow dung or diesel fuel. I did use a natural honey product on it though. I was supposed to be pampering Jenny but she actually pampered me! I was just a bit frantic for my first show. Good news! I had another show 3 days later with about 15 guests in attendance and it went beautifully! Wish me future success and if you need any cooking equipment, I can hook you up! Hi! I'm Tammy. This blog is my life, 365 days a year. My family rocks, my God loves and you guys make me happy. I love to share my faith to prove there is happiness even while outwitting a disability! You'll also find recipes for delicious food, spiritual food to feed your faith and humorous food to tickle your funny bone. Please fill up a doggie bag and take some home with you! No leftovers please! tammy p stafford 2013. Watermark theme. Theme images by Jason Morrow. Powered by Blogger.